Congratulations to Messalonskee Middle School for being identified as one of the top 38 elementary and middle schools to visit in the nation. According to Tom Vander Ark’s Education Week blog, On Innovation, Messalonskee Middle School is among the top schools in the nation that achieve extraordinary results, create powerful learning experiences, and/or have created innovative technology blends. 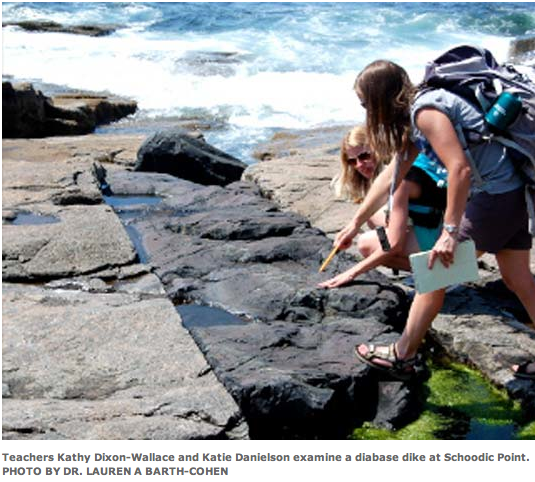 Messalonskee Middle School in Maine, students have Learning Goal Time (LGT) every day, with a full two hours once a week to work on assignments and get the extra help they need. 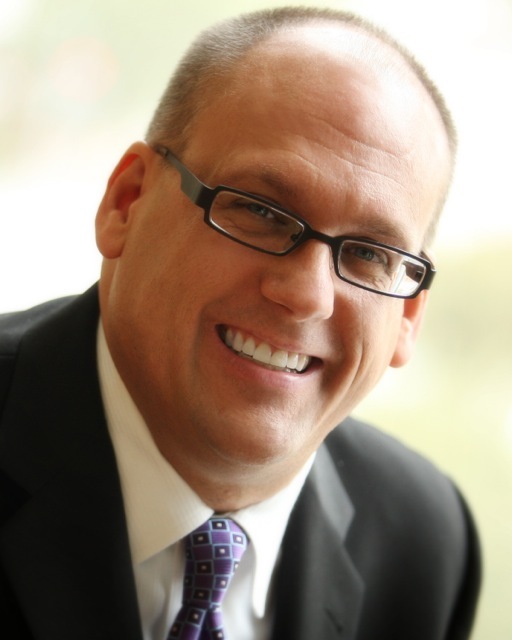 Chris Sturgis has featured the school on CompetencyWorks and in this brief. 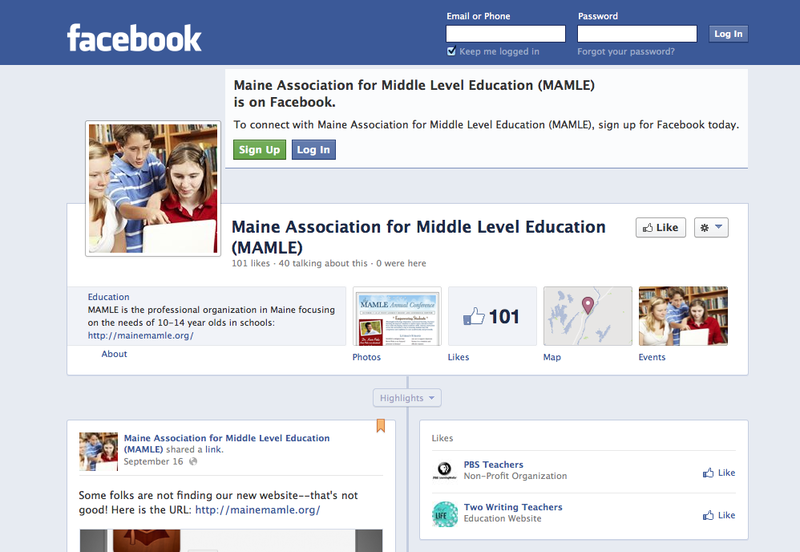 MAMLE, The Maine Association for Middle Level Education, is Maine’s only professional association of teachers, administrators, and parents who have joined together to specifically support the development of quality programs serving the needs of young adolescents. For over a quarter of a century MAMLE and its partners have consistently advocated for and promoted a better understanding of middle grades education across the state. It is a source of ideas, information, and support for everyone working with and on behalf of young adolescents. Of course MAMLE can only do this work with the active support, involvement and contributions of dedicated Mainers, like you! 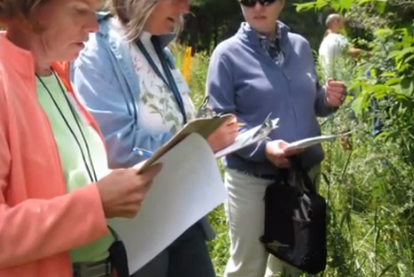 So, if you, or your school or organization don’t already belong to MAMLE this is the perfect time to join with nearly 100 Maine schools and thousands of educators that work with young adolescents in grades 5-9. Check out this short 3 minute video from the MAMLE Board of Directors as they share why they belong, and why you should too. We look forward to working with you on behalf of all middle grades students, and hope you’ll join MAMLE! The new MAMLE website is up and running. It has all of the conference information on the Conference page–Check it out! In a surprise assembly at King Middle School (KMS) in Portland Tuesday morning, Education Commissioner Stephen Bowen announced Karen MacDonald, who has served students in Portland Public Schools since 1979 and been at KMS since 1989, as Maine’s top teacher. Those students were joined in celebrating MacDonald by Commissioner Bowen, Portland School District Superintendent Manny Caulk, KMS Principal Mike McCarthy, past Maine Teacher of the Years including 2013 winner Shannon Shanning, Educate Maine Director Tanna Clews, Bangor Savings Bank Regional Market Manager Stephan Woods, Hannaford Director of Corporate Communications Michael Norton and State Board of Education Chair Nancy Perkins and Vice-Chair Peter Geiger. 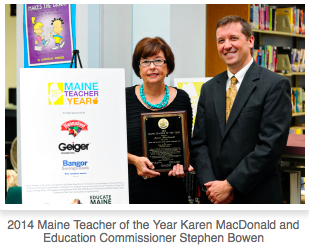 Maine Teacher of the Year is a program of the Maine Department of Education, administered by Educate Maine. Educate Maine is a business-led organization whose mission is to champion college, career readiness and increased education attainment with a goal of Maine’s students and workers being the best educated and most highly skilled in the world. 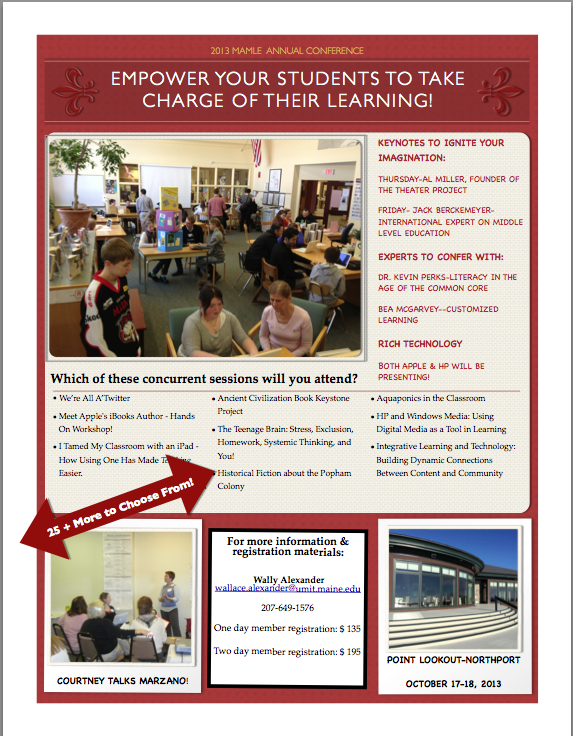 For more information, visit http://www.educatemaine.org. Funding for the program is generously provided by Hannaford, Geiger and Bangor Savings Bank with support from the State Board of Education and the Maine State Teacher of the Year Association. MAMLE’s annual conference is coming right up! A flyer and registration materials were sent to all schools this week. Mark your calendars! 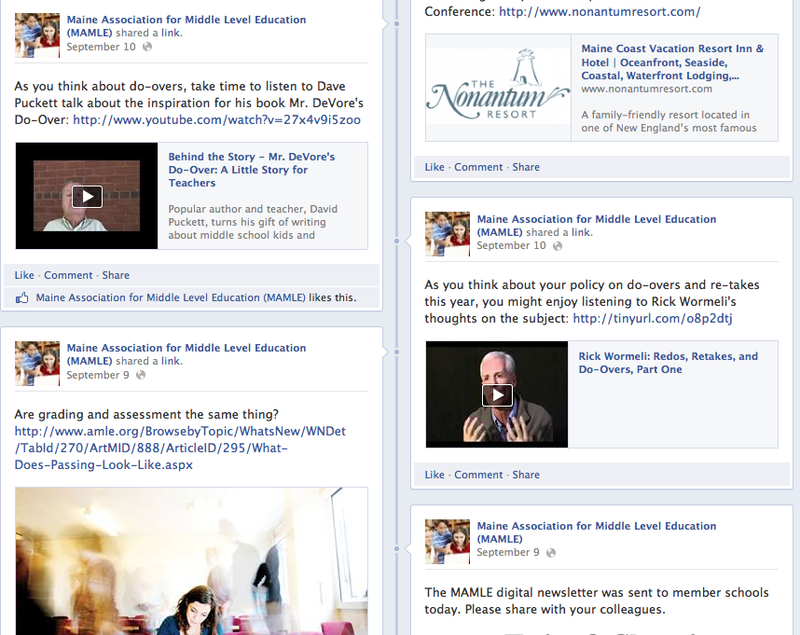 For current information about the specifics of the conference check out the conference page at MAMLE’s new website: http://mainemamle.org/conference/ You can download registration and housing materials as well as read a preview of some of the sessions! Do you know about Middleweb.com? If not you should! MiddleWeb is all about the middle grades with a sharp focus on teaching and learning in grades 4-8. Here’s a description from their website. • Resource Roundups: short, link-laden essays built around a theme. Browse here or search for keywords. • Guest Posts: Just what you might expect…first-person articles. The voices of middle grades education stars and many lesser known teachers and school leaders up on the front lines who have stories to tell and good practice to share. • Book Reviews: Reviews of professional books of interest to educators working in the middle. If you’re interested in becoming a MiddleWeb reviewer, let us know. We’ll share a list of what’s available and some basic guidelines for review writing. You pick what you’d like to read, write the review, keep the book. We publish your reviews, make you famous. • Interviews: We’re talking with interesting people who have expertise around middle grades education — or just do great things for middle grades kids and schools. Peruse our Five Q Interviews for ideas, insights, and plain good chat. As part of the new MiddleWeb experience, we’ve formed a partnership with the SmartBrief Education news team to produce the twice-weekly MiddleWeb SmartBrief e-newsletter. You may be familiar with the nation’s premier professional newsletter organization, which also publishes ASCD SmartBrief, Accomplished Teacher SmartBrief, SmartBrief on Ed Tech and other education reports. MiddleWeb SmartBrief specializes in Grades 4-8 news and resources. We work with SmartBrief editors to shape the content and also contribute our own news and resources to every issue. Subscriptions are free, your address is kept confidential, and you can unsubscribe anytime with a single click. Here’s some of the latest items from the MiddleWeb Smartbriefs. “A gift to preservice and practicing teachers that will be hard to keep on the shelf” (Teachers College Record). 10 Things Every Writer Needs to Know is a comprehensive guide to teaching any genre or form in grades 3-9. You’ll get a rich collection of mentor texts, tips, and launching points. Preview Chapter 1: Getting and Keeping Writers Motivated. Summer off? Yeah, right! I’m already excited for next year! So what does a middle school teacher do with his/her extra time now that school is over and he/she is getting antsy? I don’t know about you, but I’m already thinking about how I can rearrange my classroom for next year. I’ve checked out ideas on Pinterest, checked in with other teacher-friends, and have pretty much figured out how I’m going to do it. So, what’s next, you ask? Hmm, professional development! I love to learn new things, which is good, since I will be teaching two different subjects next year than I taught this year, and I’ve never taught of them before. Though I have a bit of anxiety about the switch, I’m really looking forward to it. I’m also really lucky to have two other math/science teachers at my grade level who are willing to share their knowledge and materials with me. Participants at the STEM Camp learn about plant life. Doesn’t that tie into the Bright Futures Report beautifully? A focus on collaboration and learning sounds perfect! You can register right at the website I’ve linked above. Hopefully I’ll meet some of you there! 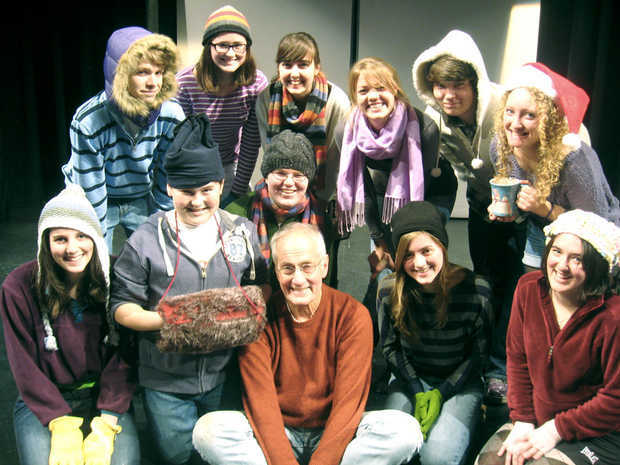 Thank you to Lisa Smith for her permission to write about the camp. She’s the Outreach/Camp Director and is happy to answer any questions you may have! P.S. Bring your insect repellant and sun screen for those outdoor options! Did you see this article online? I love the fact that fifth and eighth graders worked together on the project! This type of collaboration builds a sense of community across the school and builds a positive school culture. 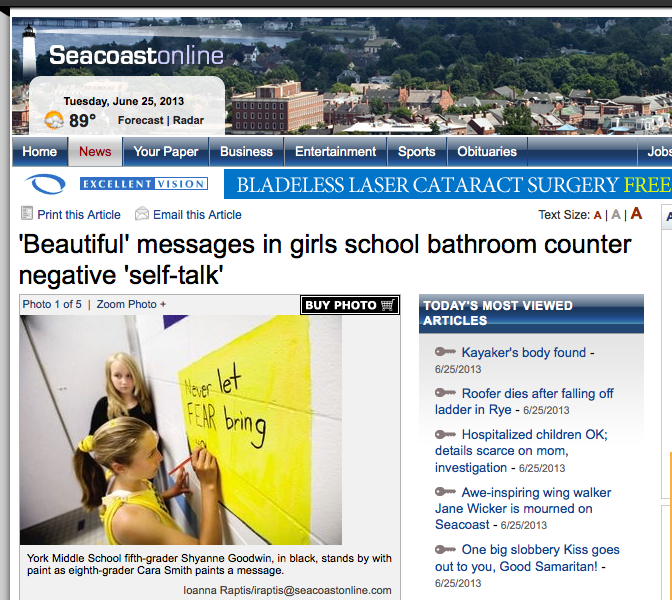 I am also impressed that the school recognizes the detrimental effect negative self-talk has on adolescent development and is taking action to promote social-emotional learning as well as academics. Visit the Collaborative for Academic, Social, and Emotional Learning to learn more about the connections between achievement and social-emotional learning: http://casel.org/. Well done York Middle School!